Amber, fossilized resins that originate from various tree and other plant sources, has been used for personal adornment and other purposes for several thousand years. It has been found in various parts of the world, but the main historical source is the land that surrounds the Baltic Sea – principally in present-day Poland, Lithuania, Latvia and the Russian enclave of Kaliningrad. Discovered on these beaches after storms and mined from nearby sedimentary deposits, amber is found in irregular shapes, usually in small sizes in yellow to orange or brown colors, and can range from opaque to transparent. Besides its ornamental use, amber has been of great scientific importance because plant and animal life from the geologic past is often preserved in its resin. Amber from the Baltic region constitutes the largest known deposit of fossil plant resin and the richest repository of fossil insects of any geological age. This reading list was compiled to give you an opportunity to learn more about the history of Baltic amber. A number of the articles were published in the 1800s and early 1900s – when many classical gem deposits of historical importance were discovered and gemology and mineralogy became sciences. The list is presented in chronological order to emphasize the development of ideas over time. The list is not comprehensive, but a compilation of some interesting gemological information that has often been forgotten or overlooked. Regarding the GIA library’s holdings and on-site access, please contact the GIA library in Carlsbad. Essay on the Origin of Amber, J. Fothergill, Philosophical Transactions of the Royal Society of London, Vol. 43, pp. 21-25, (1744). In an early study, the author describes amber as being of resin from trees that had been buried in sediments and then fossilized. A shortened version of the article subsequently appeared in the Philosophical Transactions (Abridged), Vol. 9 (for 1744 to 1749), pp. 9-12, (1809). On Amber and the Organic Remains Found in It, J.H.R. Göppert, Quarterly Journal of the Geological Society, Vol. 2, No. 1/2, pp. 102-103, (1846). The author discusses the origin of amber from forests that are now beneath the Baltic Sea, where they were fossilized after burial in the sediments. He makes an attempt to identify some of the species of trees found as fragments within or associated with the amber. General Considerations on the Organic Remains, and in Particular on the Insects, which have been Found in Amber, F.J. Pictet, Edinburgh New Philosophical Journal, Vol. 41, No. 82, pp. 391-401, (1846). This article discusses the preservation of insect life in amber. On the Amber Beds of East Prussia, K. Thomas, Annals and Magazine of Natural History, Series 2, Vol. 2, No. 12, pp. 369-380, (1848). The amber deposits on the Samland peninsula (near present-day Kaliningrad), the associated fossils that are found there, and the geologic origin of these deposits, are discussed by the author. Amber, Author unknown, Chambers’s Edinburgh Journal, Vol. 15, No. 368, pp. 46-48, (1851). This short article provides a review of the historical importance of amber and of the ideas on its geological formation. On the Cavities in Amber Containing Gases and Fluids, D. Brewster, Philosophical Magazine and Journal of Science, Vol. 5, No. 32, pp. 235-236, (1853). In this short note, the famous Scottish scientist describes gas and fluid inclusions he observed in amber. Die Bernstein- und Braunkohlenlager des Samlandes [The Amber and Brown-Coal Deposits of Samland], G. Zaddach, Schriften der Koniglichen Physikalich-Ökonomischen Gesellschaft zu Königsberg, Vol. 2, pp. 1-44, (1861). A description of the Baltic amber deposits is presented. A Gossip about Amber, B. Lambert, Nature and Art, Vol. 2 (March), pp. 74-78, (1867). The author presents a review of the sources, history and lore about amber. Amber: Its Origin and History, as Illustrated by the Geology of Samland, G. Zaddach, Quarterly Journal of Science, Vol. 5, (April), pp. 167-185, (1868). The geology of the amber deposits on the Samland peninsula is described in some detail. Die Bernsteingräbereien im Samlande [The Amber Mines in Samland], W. Runge, Zeitschrift für das Berg-, Hütten- und Salinen-Wesen im Preussichen Staate, Vol. 16, pp. 224-255, (1868). The amber mines on the Samland peninsula are described. Beobachtungen über das Vorkommen des Bernsteins und die Ausdehnung des Tertiärgebirges in Westpreussen und Pommern [Observations on the Occurrences of Amber in the Expanse of Tertiary Mountains in Western Prussia and Pommerania], E.G. Zaddach, Zeitschrift für das Berg-, Hütten- und Salinen-Wesen im Preussichen Staate, Vol. 18, pp. 163-178, (1870). The author describes the geological setting of the Baltic amber deposits in modern-day Lithuania, Poland and Russia. The Amber of Samland, Author unknown, Appleton’s Journal, Vol. 6, No. 134, pp. 461-463, (1871). This article discusses the recovery of amber from the Samland peninsula, including mining along the coast, fishing for pieces with nets, and the use of divers to search for amber on the sea bottom. About Amber, Author unknown, Chambers’s Journal, Vol. 50, No. 518, pp. 757-760, (1873). General information on amber, including where it is found and the types of ancient plants and animal life it may contain, is discussed in this article. Amber on the Shores of the Baltic, J.S. Tutweiler, Appleton’s Journal, Vol. 15, No. 377, pp. 747-749, (1876). General information on the history and lore of amber is given. The author also describes three methods used to recover the material: by “digging” down to the sediment layer where the amber occurs: by “spearing” in shallow ocean water using poles to move rocks on the bottom that might cover pieces of amber; and by “fishing” using nets to recover floating pieces of amber from ocean waves near to the shore. Bernsteinland und Bernsteinstrassen [Amber Lands and Amber Roads], G. Bujack, Altpreussische Monatsschrift, Vol. 16, No. 1/2, pp. 177-188, (1879). The amber-producing region in eastern Prussia is discussed. Concerning Amber, E.A. Smith, American Naturalist, Vol. 14, No. 3, pp. 179-190, (1880). The author provides historical information on amber and describes the deposits in the Baltic region. Amber, Author unknown, Van Nostrand’s Engineering Magazine, Vol. 24, No. 3, pp. 206-207, (1881). General information on amber lore, and some simple tests to distinguish amber from copal. Amber, Author unknown, Chambers’s Journal, Vol. 59, No. 953, pp. 214-215, (1882). This brief article gives some general information on the lore of amber. The Amber Flora, J.S. Gardner, Nature, Vol. 28, No. 711, pp. 152-153, (1883). A review is presented of a book written by R. Goeppert and A. Menge on the ancient plant remains found in Baltic amber. Some Facts about Amber, Author unknown, Jewelers’ Circular and Horological Review, Vol. 15, No. 10, pp. 312-313, (1884). Based on a visit to the Baltic coast, the author discusses the amber industry around the town of Palmnicken on the Samland peninsula. The Baltic Amber Coast in Prehistoric Times, A.J. Evans, Littell’s Living Age, Vol. 177, No. 2288, pp. 315-318, (1888). The author reviews a book by A. Lissauer in which the prehistoric history of the amber coast is described. From at least the 16th century BC, amber was brought from the Baltic region across Central Europe to the Mediterranean area on a land trade route. Amber, F.R. Kaldenberg, The Swiss Cross, Vol. 4, No. 3, pp. 72-73, (1888). 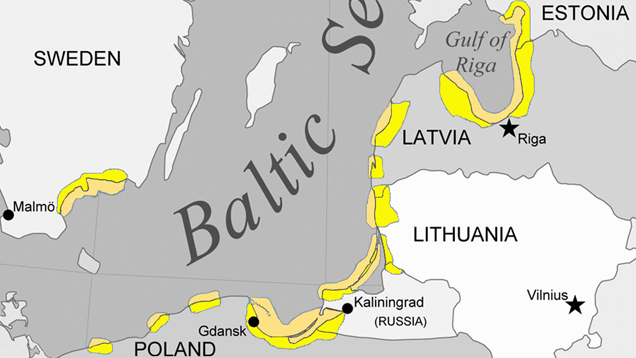 A short description of amber mining along the Baltic coast of East Prussia is presented. Concerning Amber, E.A. Smith, American Naturalist, Vol. 14, No. 3, pp. 179-190, (1888). A description is given of the amber deposits on the Samland peninsula, which historically have been the most important source of this material. Amber: Its History, Occurrence, and Use, J.S. Newberry, Transactions of the New York Academy of Sciences, Vol. 8, pp. 156-158, (1889). The abstract of a public lecture by the author who, at the time, was president of the Academy. Amber, A.H. Japp, “Days with Industrials”, pp. 102-111, (1889). The lore of amber and the operation of the amber mines along the Baltic coast are described. “Monographie der Baltischen Bernsteinbäume [Monograph on Baltic Amber Trees],” H.W. Conwentz, W. Engelmann Verlag, Danzig, Germany, 151 pp., (1890). Book not seen. Der Baltische Bernstein [Baltic Amber], H. Potonié, Naturwissenschaftliche Wochenschrift, Vol. 6, No. 3, pp. 21-25, (1891). A detailed description of the material is given in this article. Amber and Fossil Plants, A.C. Seward, Natural Science, Vol. 1, No. 5, pp. 377-385, (1892). The author discusses the fossil plant record that is preserved in amber samples from various localities. Amber, O.F. Klotz, Goldthwaite’s Geographical Magazine, Vol. 5, No. 1/2, pp. 32-35, (1893). Some general information is given about the tree species that produce the resins that make up amber, along with notes on the amber deposits in the Baltic area and elsewhere. Amber Mines, W.P. Pond, Frank Leslie’s Popular Monthly, Vol. 35, No. 3, pp. 373-379, (1893). The author gives a detailed description of the history and operation of the amber mines on the Samland peninsula. Amber, Author unknown, Chambers’s Journal, Vol. 71, No. 536, pp. 209-211, (1894). A short article that describes amber mining along the Baltic coast. About Amber, Author unknown, Cornhill Magazine, Vol. 25, No. 147, pp. pp. 278-287, (1895). This article presents general information on the occurrences, origin and lore of amber. “The Tears of the Heliades, or Amber as a Gem,” W.A. Buffum, Third Edition, Sampson Low Marston & Co., London, 146 pp., (1898). This book presents the lore of amber and its use for personal adornment. Amber: Its History and Mystery, J. Milne, Windsor Magazine, Vol. 8, (August), pp. 272-276, (1898). The history of amber and some of the European sources of the material are described. The Baltic Amber Mines, M. Lane, Science Gossip, Vol. 6, No. 69, pp. 273-274 and No. 71, pp. 331-333, (1900). The author visits the amber mines near Palmnicken and describes the mining of amber. Amber, T.M. Hughes, Archaeological Journal, Vol. 58, No. 1, pp. 35-46, (1901). The author presents general information on the material. Where Amber is Mined, E. Charles, The World’s Work, Vol. 4, No. 21, pp. 301-304, (1904). A visit to the amber mines near Palmnicken is described by the author. Amber Deposits of the Baltic, O.H. Hahn, Engineering and Mining Journal, Vol. 91, No. 14, p. 728, (1911). A short article that contains a description of the mining industry in Samland. Amber, Author unknown, Mining Journal, Vol. 100, No. 4041, p. 129, (1913). This is a brief description of amber mining. The Gold of Samland, Author unknown, Jewelers’ Circular, Vol. 85, No. 21, p. 51, (1922). A short note on the history of Baltic amber is presented. Amber: Its Physical Properties and Geological Occurrence, O.C. Farrington, Field Museum of Natural History, Department of Geology Leaflet, No. 3, pp. 1-7, (1923). The author, a curator at the museum, gives a general summary of the material. Prehistoric Routes between Northern Europe and Italy Defined by the Amber Trade, J.M. de Navarro, Geographical Journal, Vol. 66, No. 6, pp. 481-503, (1925). Article not seen. Amber – Gem of the Ages, H.H. Cox, Lapidary Journal, Vol. 7, No. 2, pp. 100-108 and No. 3, pp. 196-204, (1953). The author speaks about the use of amber in the jewelry trade. The Baltic Amber Deposits, E.W. Berry, Scientific Monthly, Vol. 24, No. 3, pp. 268-278, (1927). Article not seen. “The Ancient Amber Routes and the Geographical Discovery of the Eastern Baltic,” A. Spekke, M. Goppers, Stockholm, 120 pp. (1957). Book not seen. Infrared Spectra as a Means of Determining Botanical Sources of Amber, J.H. Langenheim and C.W. Beck, Science, Vol. 149, No. 3679, pp. 52-54, (1965). Based on samples of amber and modern resins, the authors discuss the use of infrared spectroscopy to determine the botanical sources of fossil resins. The Analysis of Archaeological Amber and Amber from the Baltic Sea by Thin-Layer Chromatography, D. Lebez, Journal of Chromatography A, Vol. 33, pp. 544-547, (1968). Article not seen. Amber: A Botanical Inquiry, J.H. Langenheim, Science, Vol. 163, No. 3872, pp. 1157-1169, (1969). A discussion is presented of the importance of amber for scientific studies of the biological evolution of resin-secreting plants. The author reviews the worldwide occurrences of this material. The Composition of Succinite (Baltic Amber), L.J. Gough and J.S. Mills, Nature, Vol. 239, pp. 537-538, (1972). The authors discuss the chemical composition and botanical origin of Baltic amber. “Baltic Amber: A Paleobiological Study,” S.G. Larsson, Scandinavian Science Press, Klampenborg, 192 pp., (1978). Book not seen. “Amber – The Golden Gem of the Ages,” P.C. Rice, Van Nostrand Reinhold, New York, 289 pp., (1980). General information on amber history and lore is presented. The Chemical Composition of Baltic Amber, J.S. Mills, R. White, and L.J. Gough, Chemical Geology, Vol. 47, No. 1/2, pp. 15-39, (1984). This article presents data from the chemical analysis of amber samples. The Role of the Scientist: The Amber Trade, the Chemical Analysis of Amber, and the Determination of Baltic Provenience, C.W. Beck, pp. 191-199. Criteria for the “Amber Trade”: The Evidence in the Eastern European Neolithic, C.W. Beck, pp. 200-209. Use of Pyrolysis Mass Spectrometry in the Identification of Amber Samples, G.O. Poinar and J. Haverkamp, pp. 210-221. Preservative Qualities of Recent and Fossil Resins: Electron Micrograph Studies on Tissue Preserved in Baltic Amber, G.O. Poinar and Roberta Hess, pp. 222-230. East Baltic Amber in the Fourth and Third Millennia B.C., M. Gimbutas, pp. 231-256. Amber and the Mycenaeans, H. Hughes-Brock, pp. 257-267. Baltic Amber in the Ancient Near East: A Preliminary Investigation, J.M Todd, pp. 292-301. Tactius on the Ancient Amber-Gathers: A Re-evaluation of Germania, M.D. Olcott, pp. 302-315. The Word for Amber in Baltic, Latin, Germanic, and Greek, G. Bonfante, pp. 316-319. Amber in Latvian Folk Songs and Folk Beliefs, V. Vīķis-Freibergs, pp. 320-340. Spectroscopic Investigations of Amber, C.W. Beck, Applied Spectroscopy Reviews, Vol. 22, No. 1, pp. 57-110, (1986). A review of the spectroscopy characterization of ancient amber samples. “Amber,” H. Fraquet, Butterworths, London, 176 pp., (1987). General information on amber sources and history is presented. Analysis of European Amber by Carbon-13 Nuclear Magnetic Resonance Spectroscopy, J.B. Lambert, C.W. Beck and J.S. Frye, Archaeometry, Vol. 30, No. 2, pp. 248-263, (1988). A comparison is made between ambers from the Baltic region and those from southern Europe. “Life in Amber,” G.O. Poinar, Stanford University Press, Stanford, 350 pp. (1992). This book discusses the history, lore and scientific study of amber. Forgeries of Fossils in “Amber”: History, Identification, and Case Studies, D.A. Grimaldi, A. Shedrinsky, A. Ross, and N.S. Baer, Curator: The Museum Journal, Vol. 37, No. 4, pp. 251-274, (1994). Because amber samples with inclusions of animal or plant material are highly prized, forgeries are more convincingly and routinely made than is the case for most other kinds of fossils. The author discusses forgery techniques and the identification of fraudulent amber samples. The Range of Life in Amber: Significance and Implications in DNA Studies, G.O. Poinar, Experientia, Vol. 50, No. 6, pp. 536-542, (1994). The author reviews the major fossiliferous amber deposits, the categories of life forms in amber reported from each, and the information that could be provided by further DNA studies of fossils in amber samples. “Amber: Window to the Past,” D.A. Grimaldi, H.N. Abrams, and American Museum of Natural History Press, New York, 216 pp. (1996). Based on an exhibition held at the museum, this book explores many aspects of both the lore and study of amber. Physicochemical Structural Characterization of Ambers from Deposits in Poland, F. Czechowski, B.R.T. Simoneit, M. Sachanbiński, J. Chojcan, and S. Wolowiec, Applied Geochemistry, Vol. 11, No. 6, pp. 811-834, (1996). The authors studied eight amber samples from several locations and present data on the physical and chemical properties. Fossils Explained Part 22: Palaeontology of Amber, G.O. Poinar, Geology Today, Vol. 14, No. 4, pp. 154-160, (1998). Article not seen. Quaternary Amber-bearing Deposits on the Polish Coast, B. Kosmowska-Ceranowicz, Zeitschrift für Angewandte Geologie, Sonderheft, No. 2, pp. 73-84, (2004). The occurrence of amber along the coast of Poland is described. Amber: The Organic Gemstone, J.B. Lambert and G.O. Poinar, Accounts of Chemical Research, Vol. 35, No. 8, pp. 628-636, (2002). Based on a study of several hundred samples, the authors discuss the use of solid-state carbon-13 nuclear magnetic resonance spectroscopy to potentially assign a geographical origin to archaeological amber samples. “Atlas of Plants and Animals in Baltic Amber,” W. Weitschat and W. Wichard, F. Pfeil Verlag, Munich, 256 pp., (2002). Book not seen. Analytical Characterization of Baltic Amber by FTIR, XRD and SEM, L. Pakutinskiene, J. Kiuberis, P. Bezdicka, J. Senvaitiene and A. Kareiva, Canadian Journal of Analytical Science and Spectroscopy, Vol. 52, No. 5, pp. 287-294, (2007). Recently collected and archaeological amber samples from Lithuania were investigated by several analytical techniques. Baltic Amber Deposits, B. Kosmowska-Ceranowicz, InColor Magazine, No. 12, pp. 22-25, (2009). The author reviews the occurrence and origin of the Baltic amber deposits. Stable Isotopes (H, C, S) and the Origin of Baltic Amber, A. Gaigalas and S. Halas, Geochronometria, Vol. 33, pp. 33-36, (2009). Based on the chemical analysis of certain isotopes, the authors discuss the botanical and geological origin of amber. “Biodiversity of Fossils in Amber from Major World Deposits,” D. Penney (ed. ), Siri Scientific Press, Manchester, 304 pp., (2010). This book chronicles the various types of fossils found in amber samples from major world deposits including those in the Baltic area. “Amber – Tears of the Gods,” N.D.L. Clark, Dunedin Academic Press, Edinburgh, 118 pp., (2010). A general review of the sources and uses of amber is provided in this book. “Amber – The Natural Time Capsule,”A. Ross, Firefly Books, Buffalo, New York, 112 pp., (2010). The author discusses the role amber plays in preserving plant and animal life from the geological past. Photoageing of Baltic Amber – Influence of Daylight Radiation Behind Window Glass on Surface Colour and Chemistry, G. Pastorelli, J. Richter, and Y. Shashoua, Polymer Degradation and Stability, Vol. 96, No. 11, pp. 1996-2001, (2011). This study was conducted to evaluate the possible degradation of amber samples in museum environments as a result of exposure to daylight. The authors were able to confirm this degradation in color, and the oxidation of sample surfaces, for amber samples placed behind glass in a museum-type display. Amber: An Organic Fossil Gem, K.H. Rohn, Rock & Gem, Vol. 42, No. 4, pp. 60-63, (2012). General information is discussed on amber as a gem material. Explore amber history, research, quality factors, and more in the GIA Gem Encyclopedia.